Astana’s Luis Leon Sanchez flicked the bird at breakaway companions in yesterday’s stage of the Giro d’Italia, seemingly in response to something that was said by one of them, but that’s a mild falling out compared to some we’ve witnessed from professional riders over the years. Here are some of the best examples of what happens when pros get aggressive. Lars Boom was disqualified from the Tour of Norway last week after he apparently elbowed and then punched Sport Vlaanderen's Preben Van Hecke. "He was on my wheel and I almost crashed, so I got a little hot headed,” said Lars Boom. “I don't want to crash, especially when an idiot does something like that." A race referee told Norway’s TV2, “You cannot punch a competitor and particularly not in the face… So we have taken the decision of taking him out of the race." Crikey! Apparently as a result of an incident during the finish of Stage 6 of the 2010 Tour de France, Carlos Barredo hurled himself at Rui Costa, waving his front wheel in the air and shouting “hijo de puta!” That’s Spanish for… well, it’s quite rude. It all kicked off in a primary school playground style, both riders picking up a fine along with a few bruises. German sprinter Marcel Kittel was left with blood streaming down his face at last year’s Dubai Tour, claiming afterwards that he had been struck by Astana's Andriy Grivko – who was subsequently thrown off the race. Marcel Kittel proved that he can deal out the aggro too, if only to his bike, during Stage 2 of Tirreno-Adriatico 2014. Kittel had been hoping to contest the sprint finish but a crash put paid to his chances with 2.5km to go. He really didn’t take it well. Even mild mannered Chris Froome has been known to get riled on occasion, notably on the Col de Peyresourde during the 2016 Tour de France when he lashed out at an encroaching Colombian fan. "Nothing against the Colombian fans," Froome told the press. "I think they’re fantastic and bring a great atmosphere to the race. But this guy in particular was running right next to my handlebars [and] had a flag that was flying behind him. It was just getting dangerous, so I pushed him away, I lashed out and pushed him away." So there you go, it was as a push, not a punch or a forearm smash. Whatever, Froome went on to win the stage, the race and considerably more money than the 200 Swiss Francs (around £150) fine that was imposed on him by race officials for “incorrect behaviour”. Everyone’s favourite pro cycling gurner Thomas Voeckler (retired 2017) stopped on a climb during the 2014 Tour de France to dish out a lesson in spectating etiquette. The French rider was on a hors categorie (HC, beyond category) climb at the time. Fair play to Tommy, we say. Bike races and dogs – they’re not a great fit. You’d have thought that was obvious, but apparently not to everyone judging by frequent video evidence. Philippe Gilbert made that point, in so many words, to the owners of a Pyrenean Mountain Dog that caused a pile-up during the 2012 Tour de France… and who can blame him? An injured Cadel Evans really wasn’t into being touched during interviews after Stage 10 of the 2008 Tour de France. Evans looked pretty scary, especially for a man who was clutching a cuddly lion at the time. Alberto Contador had beef with some halfwit dressed as a surgeon who was running alongside him on Alpe d’Huez in the 2011 Tour de France. 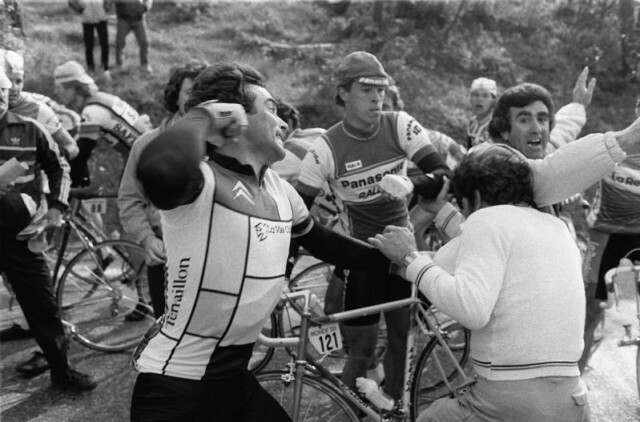 Bertie dealt out a swift flick to the face – ‘punch’ would be putting it a bit strong. It’s a classic. How could we not include it? Bradley Wiggins achieved a lot in his cycling career – including winning the Tour de France and five Olympic gold medals and achieving several world records – but unquestionably* his greatest accomplishment was parking his bike perfectly against a wall from half a road-width away while having a bit of a strop - understandably - during the fourth stage of the Giro del Trentino in 2013. * Well, it’s quite questionable, to be honest. This one’s a questionable inclusion, admittedly, because the incident at the end of Stage 4 of the 2017 Tour de France didn't result from a rider getting angry. Rather, things just got a bit tasty in the sprint for the line, as they do on a regular basis, Peter Sagan's elbow flicked out – whether intentionally or in an attempt to regain his balance – and Mark Cavendish went down like a sack of spuds. Cav broke his shoulder blade and Sagan was lobbed out of the race, so there were no real winners here… apart from the other sprinters, perhaps, like Marcel Kittel who ended up with five stage victories. What did we miss out? Let us know in the comments below. My favourite is Cippo lobbing a water bottle at a motorbike. Corker! Totally forgot about that one. It is a minor miracle more fans running along aren't pushed out of the way although the TV cameras can't be everywhere at the same time. Really. The Badger should be first in the list.